Eboné Bell of Tagg Magazine. Photo by Julian Vankim. Eboné Bell practices what she preaches. In a few short minutes of chatting, Bell treats me, a stranger, like a friend. “Are you coming to the party this Saturday?” she asks casually, not yet realizing that I’m several hundred miles away. I so wish! Alas, I have Lesbian.com pieces to work on, another job, and a very controlling cat who would be supremely unhappy if I dashed off to this extremely exciting, big news, launch party for the absolutely fantastic Tagg Magazine in Washington, DC. 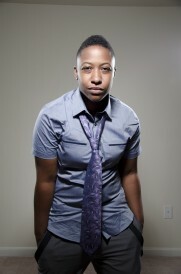 Bell is the driving spirit behind Tagg, the DC area’s brand spankin’ new bent ladies’ magazine. Made for women, by women, Tagg aims to be smart, savvy, and majorly community oriented. In fact, community and unity are the dominant themes of our whole conversation, and Bell’s amicable energy make it seem very real: Tagg doesn’t just aim to bring women together. Tagg will bring women together. Tagg launched in the beginning of September with a fall issue featuring Project Runway’s Alicia Hardesty, but this coming weekend is the primo, grand celebration of its emergence into the DC/DelMarVa scene. Bell and her business partner have teamed up with the ladies of LURe, responsible for some big DC girl parties, to host an official launch at the legendary Cobalt. From 9p.m. to 10p.m. at Level One, Tagg will give the VIPs who have supported the magazine in its infancy some love with a swanky cocktail hour thank you. Upstairs, from 10p.m. to 3 a.m., there will be dancing, drinking, “TAGGing” and a wild good time. The locally legendary Destruction Dancers will perform a special routine on stage. A dance contest will grant the best dancer in the crowd a $200 prize. Raffle boys and girls will cruise the room, offering up tickets to try your luck for gift certificates, Washington Wizards seats, and an authentically signed poster and CD donated by Nicki Minaj, herself. And while it is a lesbian publication, it’s not rigidly exclusive. Bell is not interested in drawing divisions based on gender or the nuances of personal identity and limiting the reach of community and interpersonal connections. A transguy gets “TAGGed” in one of their promo videos. Bell never leaves out bisexual women when referencing Tagg’s readers or audience. A well-known trans-rights activist, a transwoman, is quoted in their “That’s What She Said” feature. Tagg is voicing from the start that community is bigger and better when that community is welcoming. 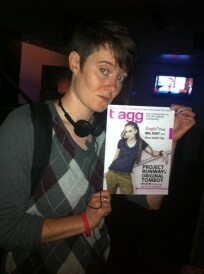 Check out Tagg online: http://www.taggmagazine.com. Tagg Magazine’s Official Launch Party will take place Saturday, October 20, at Cobalt, 1639 R St NW, Washington DC. The event will be hosted by the ladies of LURe/Bare, 10 pm to close with DJ Rosie.